The legend about the Creator God, Bramha describes the creation of this lake. When the demon Vajra Nabha killed Brahma's children, he in turn struck him with his weapon, a lotus flower. Vajra Nabha died with the impact, and the petals of the lotus fell at three places. 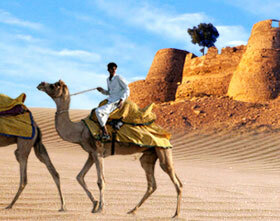 One of them is Pushkar, where a lake sprung into being. Brahma is supposed to have performed sacrifice at this lake on Kartik Purnima (the full moon day of the Kartik month), hallowing the place. 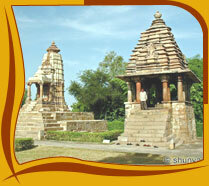 Sacred to Brahma, Pushkar boasts of its temple dedicated to him, which is the only one of its kind in the world. 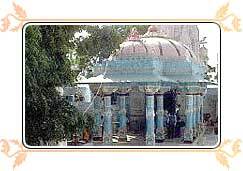 A dip in the waters of Pushkar and worship at his temple ensure salvation. 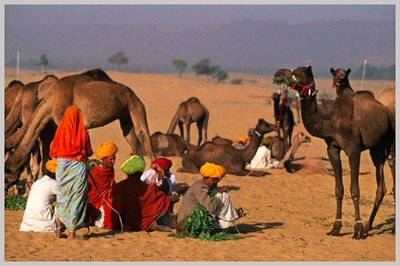 So thousands flock to Pushkar to observe the ritual on kartik Purnima, or on any of the four days preceding it. Pushkar boasts temples, though few are as ancient as you might expect at such an important pilgrimage site, since many were destroyed by Aurangzeb, a Mogul ruler and subsequently rebuilt. 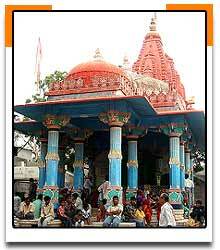 The most famous is the Brahma Temple, said to be the only temple in the world dedicated to this deity. It stands on a high plinth with the Marble steps leading up to it. A silver turtle is set on the floor facing the Sanctum-Sanctorum or Girbha-griha. Around the turtle the Marble floor is inset with hundreds of silver coins. Coins engraved with donors names are also embedded in the walls. 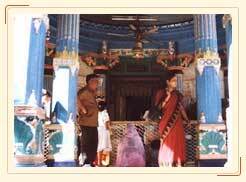 Peacocks adorn the temple walls as they are supposed to be the vehicle of lord Brahma's consort Saraswati. A small image of the milkmaid Gayatri, flanks the four-faced image of lord Brahma and is called Chaumurti The sanctuary has silver doors inside a carved marble gateway. Many Ghats run down to the Holy Lake where pilgrimsare constantly bathing in the holy waters. Joining people at the ghats has to be with some respect for their culture and privacy. And for this reason, removing shoes before approaching the ghats, no smoking and restraining from photographing bathing people is well avoided. The Pilgrims here are sensitive about comments by non-Hindus. 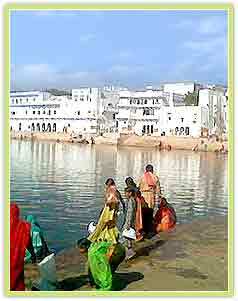 The famed waters of the Pushkar lake wash away the sins of a lifetime. 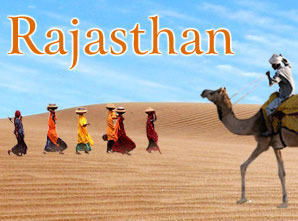 The well-known and marked with largest participation of all the festivals of Rajasthan, Pushkar is an important pilgrimage as well as the venue of a mammoth cattle fair. Bazaars, auctions, music and sports are highlight of this event. Recommended. Pushkar is a relatively small town and easy enough to get around on foot There are no auto-rickshaws in the town center. A bicycle is best to get around.